FireWire-to-USB Transfer Cable: MacBook Redeemer? A Workaround for MacBook Glossy Displays? Is the MacBook Air Overpriced or Just Expensive? 6 GB of RAM in the 'Late 2008' MacBook Pro: Any Problems or Speed Penalty? "By now, there are plenty of articles floating around praising the new Apple portable line for its beauty, speed and innovation. I can certainly agree that the new line is drool-worthy, but as a technician, I'm even more curious about its serviceability. Are the new machines another foray into frustration, à la the 12" PowerBook? Or, are they as they as ego-boostingly-easy as the MacBook Airs? Luckily, I only had to wait a few days to find out!" "...I'm not predicting wholesale adoption of Macs by larger enterprises anytime soon, but the new MacBook will make the most significant inroads into the enterprise market of any Apple product, probably ever. It comes down to price/performance, price point, design focus, durability, suitability to task and market timing...."
"That was the first thought I had when Apple unveiled the new aluminum MacBook and MacBook Pro on October 14. "Many Mac owners out there are still longing for a successor to the PowerBook G4 12". I am one of them. Someone needs the features and performance of Apple's Pro notebooks in a 12" or 13" form factor that, to me, is just right. In the days leading up to the unveiling, I had hoped that the new MacBook, already rumored to sport blazing fast graphics performance, would essentially be a MacBook Pro. As it turns out, the new aluminum MacBook is really The 13" MacBook Pro That Could Have Been...."
"Apple's bestselling MacBook laptop just got its 2008 makeover. It's a thing of beauty, clad in aluminum like its more expensive Pro siblings. It's slightly lighter than the previous black or white plastic models (and, at $1,300, more expensive), but feels sturdier and more sculpted, thanks to the tapered edges. "Last week, on the phone, I got a chance to vent my unhappiness to Steve Jobs himself...."
"After a few weeks of Internet conversation and testing, it turns out that recent MacBook and MacBook Pro models - both the just-introduced aluminum and glass models and the two previous minor updates - can address not just 4 GB of RAM, as Apple's technical specifications pages state, but 6 GB of RAM. "The laptops both have a pair of DIMM slots. The current MacBook and MacBook Pro models require new form of high-speed memory called DDR3, running at 1066 MHz. The previous models use DDR2 RAM running at 667 MHz. Standard configurations have either 2 GB or 4 GB of RAM, achieved by installing a pair of either 1 GB or 2 GB DIMMs." "So what can be done about, short of severe DIY case-cracking, mother-board soldering changes that could result in death and/or dismemberment? One option shows potential. According to ZD Net.com, Pixela offers a FireWire to USB DV transfer cable, designed specifically with digital video transfer in mind. "When we contacted Pixela, a representative told us that OS X support has been discussed by their planning committee, but no firm decisions to go forward have yet been made." Link: FireWire-to-USB: MacBook Redeemer? Maybe. Not Yet. "The late 2008 aluminum MacBooks and MacBook Pros are allegedly incompatible with Kensington locks. Apple lists the feature as a 'Kensington lock slot,' but owners have reported that the thickness of the aluminum prevents the standard locks from being used. A response from Kensington's technical support department was claimed to read 'we are sorry to inform you that the security slot of your laptop "late 2008" Aluminum MacBook is not compatible with Kensington locks.'" "Before this machine we had no major issue with the glossy screens of the original MacBook, the MacBook Air and the 2007 MacBook Pro with LED backlight. But the mirror-like display is the new MacBook's Achilles' Heel, even more than the missing FireWire port. Not everyone uses FireWire, but everyone uses that screen. "We took before-and-after comparison photos of the new MacBook, and include reference photos of a MacBook Air, a 2006 MacBook, and a (dead) 12" PowerBook G4 we had on hand." Link: A Workaround for MacBook Glossy Displays? "An official Apple forum has become a sounding board for numerous complaints that the MacBook's new multi-touch glass-covered trackpad isn't behaving itself. "Owners of shiny new metal MacBooks grumble that the trackpad freezes after roughly 50 clicks and that it suddenly comes back to life after a further 5-10 unrecognised clicks. The trackpad, unveiled last month, doesn't have the customary mouse buttons because the whole panel is itself a button." "Trackpad issues experienced by users of Apple's new unibody MacBooks and MacBook Pros will be addressed in a forthcoming software update, according to an email response from chief executive Steve Jobs. "The problem, which was documented in AppleInsider's review of the unibody MacBook Pro and covered from another user's perspective earlier this week, is the new glass trackpad's tendency not to register some physical clicks performed by the user...."
"One of the ports included with all the new (and previous generation of) MacBook Pros is an ExpressCard slot. Having never had this type of expansion before, I've decided to have a look around and see what uses it can serve. This article will give a brief overview of some of the most popular ExpressCard gadgets available." "A few people are experiencing problems with noisy cooling fans in their new MacBook Pro (Late 2008). The noisy sound emanates from the upper left hand side of the keyboard where the left cooling fan is located. Below are two audio recordings; one with normal sounding fans and one with a noisy fan." "Apple should pull out the stops and release a 3G-enabled laptop for network operators panting to get their mitts on a MacBook with built in mobile broadband connectivity. "That's what Strategy Analytics analyst Neil Mawston advised the Mac maker today. Why? Because "many operators in the US and Western Europe would jump at the chance to cross-sell a cellular MacBook to their installed base of iPhone users, in order to stimulate ARPU" - average revenue per user. "'Mobile data and Web-browsing revenues from 3.5G USB dongles are rising fast in Western Europe and North America. They are a high-growth market,' Mawston told Register Hardware. "'Bigger-screen or smaller-screen laptops with integrated cellular radios are a logical next step for Apple - and others,' he said. 'Such form-factors are within Apple's core competence and they could be quickly developed.'" "Apple's next move in terms of MacBooks will be to add built-in 3G connectivity, says analyst Neil Mawston of Strategy Analytics. Mawston contends it is a 'logical next step' for Apple, and that the technology could be added to the Pro, Air, and/or regular notebooks. The incentive would be not so much outstanding demand, as the ability of carriers in the US and Europe to sell Macs to people who have already been lured to a phone network by the iPhone." Link: 3G-Enabled MacBooks in Development? "Apple is apologizing to customers this week who had placed orders for its new entry-level Nvidia-based MacBook Airs, explaining that due to an unforeseen issue, it's unlikely to deliver those systems until shortly after the Thanksgiving holiday. "'Due to an unexpected delay, we are unable to ship your MacBook Air by the date originally quoted to you,' the company said in an email to several online store customers who were previously quoted ship times of November 5th and a delivery estimate of November 10th. 'We now anticipate shipping the item by 11/24/08 and delivering by 11/29/08.'" "The delay only appears to be affecting the entry-level 1.6 GHz model with a 120 GB SATA hard drive. The company has been actively shipping the 1.86 GHz model with 128 GB solid-state drive since late last month, will several customer orders arriving about a week earlier than anticipate." 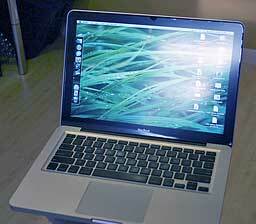 "Is the MacBook Air overpriced at $2,499 fully loaded? Seventy percent of us here at CrunchGear think so - Apple worshiper Biggs calls it a 'great machine,' however - but what do we know? Nothing, apparently, if we're to believe CNet, which comes to the conclusion that the MacBook Air, compared to other ultraportables, isn't overpriced at all. "The argument goes: ultraportables writ large are expensive, so to single out the MacBook Air is unfair. The similarly spec'd Dell Latitude E4200, for example, costs $2,495. Same thing with the Toshiba Portégé R600, which is even more expensive at $2,999. "That's pretty much it. Because all these ultraportables, when more or less similarly spec'd, are $2,500 or more, to call the MacBook Air overpriced is dishonest. "But maybe there's more to it than that...."
Link: Is the MacBook Air Overpriced or Just Plain Expensive? "Don't think cloud computing is a wonderful thing? Wait until everyone and their mother has a netbook in hand. "Yeah, you know, those small Wi-Fi-happy machines sporting 8-13" screens, flash-based storage drives, Intel Atom central processors, etcetera, etcetera. "For a large portion of the global population, even those in well-developed regions, this might seem like really loose premise. Netbooks for everyone? Why not get an full-on laptop? You can do more with your dollar! And any simple tasks on the Web can be done with some of the smartphones making the rounds on hardware review sites, right? Well, I'm not so sure...."
"The user of this MacBook dropped an external hard drive between the hinge and bottom of his display, causing the formation of very pretty cracks. "The goal of this repair, will be to change the display, while keeping the display bezel of origin. The operation will be even more complicated, because I preferred not to remove the display lid assembly from totality of MacBook,, but only to dismount the display screen from the the bezel in situ on the MacBook. "I thus DISADVISE strongly doing it like this. "Note also that do-it-yourself display screen replacement is not possible with with the new unibody MacBooks due to the glossy glass plate that is now glued to the LCD panel and its enclosure." "Apple is facing a new class-action lawsuit that charges the company with failing to fully recognize the scope of a memory slot defect in its PowerBook G4 notebooks, which has left thousands of customers with no choice but to foot hefty repair costs on their own. "New York resident Giorgio Gomelsky filed the 19-page complaint in a Northern California court last week on behalf of himself and all similarly-situated complainants who purchased an Apple PowerBook manufactured with defective memory slots from January 1, 2003 to the present. "Specifically, the suit alleges that the earlier generation Mac notebooks contain a defect that manifests itself when an owner tries to add additional memory to the first or second memory slot available in most PowerBooks, namely the PowerBook G4." "Apple is the only company I know that can tell its customers what they want and make them like it. Nobody else has pulled that off since Henry Ford decreed that consumers could get a Model T in any color they liked as long as it was black. The latest MacBook and MacBook Pro computers suggest that Apple has not lost its touch. "The latest notebooks should keep Apple's winning streak going...."
"Apple has done a complete and meaningful redesign of its top-selling commercial notebook, the MacBook Pro, for durability, serviceability, energy efficiency, and eco-consciousness. A one-piece, rigid, machined aluminum frame ('unibody') forms the MacBook Pro's internal structure, a design feature it shares with the new aluminum MacBook and MacBook Air. As with the MacBook Air, the clamshell laptop that upended the thin-and-light PC notebook market, Apple made some marvelously unorthodox design decisions for the MacBook Pro. "The MacBook Pro looks grand, no doubt, but I take little notice of eye-catching gimmicks. In this case, all that makes the MacBook Pro prettier than its predecessor has irrefutably rational reasons for inclusion in the design. Mounting the display glass flush with the lid's rounded edges is a nice look, but there's also a larger purpose: A continuous rubber gasket seals the display to the domed aluminum lid and guards against shock and vibration. Unlike with a more rigid seal, the gasket eliminates stress points that would cause the lid to bow from crush pressure." "The 'late 2008' MacBook Pro officially 'supports up to 4 GB' of 1066 MHz DDR3 SDRAM. However, that never stopped us from trying to stuff more in. We were able to expand our MacBook Pro 2.8 to 6 GB by replacing one of the 2 GB SO-DIMMs with a 4 GB module (courtesy of Trans International). "We ran memory 'hungry' apps like Adobe After Effects CS3 (multiprocessor mode) and Adobe Photoshop CS4 beyond the 4 GB barrier with no ill effects. Activity Monitor shows all 6 GB available and reports correctly how much is in use. Link: Pushing the Limit: 6 GB of RAM in the 'Late 2008' MacBook Pro. Any Problems? Speed Penalty? "...there are almost no difference in reading and writing speeds between USB 2.0 and FW400. The clear winner is the FW800 offering up to 53 MB/s in writing mode and stable 60 MB/s in reading mode...."
"Insights - Rob concurs with Hardmac that USB 2.0 on the new MacBooks is truly faster - but still not quite as fast as FireWire 400, noting that up until now, every time Bare Feats tested a USB 2.0 storage device on a Mac, the transfer rate was about half that of FireWire 400 even though it had a higher theoretical speed rating (480 Mbit/s), but observes that in the new MacBooks while it's still not quite as fast as FireWire 400, it's close enough to explain why Apple did away with the FW400 port on all new MacBooks and MacBook Pros. "That of course doesn't mitigate the loss of easy FireWire bootability and Target Disk Mode on the 13" MacBook. "Rob also tested two different SATA scenarios - a notebook drive in a SATA enclosure connected to a SATA ExpressCard and a 1.5 TB Seagate Barracuda in a SATA enclosure and connected it to the same LaCie SATA II ExpressCard/34. "What SATA lacks in convenience (not built-in to MBP, no bus power), it makes up for in speed." "Have you heard of the 'Decoy Effect'? "It's when a vendor presents you with a low-end product and a mid-range product with more features or better performance. If he sees you are leaning toward the low end, he shows you a third, high-end product. Theory is that once you see the third item, you will buy the mid-range item - which is what you really wanted in the first place. This is called 'asymmetric dominance' by behavioral scientists - or so they say in Episode 504 of the Numb3rs TV series. "Does the 2.53 GHz run cooler than the 2.8 GHz unit? In short, 'No.'" "The conclusion? If you're a serious gamer or work with graphics of any kind and you need an Apple laptop, you're gonna want the MacBook Pro. Here are the raw numbers to prove it." "Tired of 3D game benchmarks? "Well, we now have a some non-game results for 'serious' MacBook Pro users. We're starting with the 2.8 GHz MacBook Pro in our lab and will add results for other models of MacBook Pro as the days go by. "If you are getting a Mac laptop to run Pro Apps with graphics intensive functions, you're going to want a high-end MacBook Pro with the GeForce 9600M GT (or a refurbished MacBook Pro with a GeForce 8600M GT). In my opinion, if your Mac laptop only offers a GeForce 9400M (or GMA X3100) GPU, then expect only to use it for light duty (word processing, email, internet browsing)." "We finally found some time to run a proper test of the Samsung SSD installed as a BTO in the MacBook Pro. "On a more user-oriented benchmarking, the SSD is much more responsive than a 2.5" HD...."
"Western Digital has added a FireWire 800 interface to its Mac-oriented My Passport Studio external hard drive line, the better to appeal to buyers of Apple's new MacBook Pro. "MacBook owners are, of course, stuck with slower USB 2.0 drives thanks to Apple's decision not to equip the consumer-oriented model with a FireWire port. Fortunately, the WD drive has a USB port on the back too." The Checkpoint Flyer is made out of the high-quality materials Tom Bihn is known for: US made 1050 denier ballistic nylon, Japanese Dyneema rip-stop fabric, YKK splash-proof zippers, and Poron foam-padded handles. The laptop insert of the Checkpoint Flyer protects the laptop from all sides with thermo-molded foam. The Checkpoint Flyer is $220 (including laptop insert). 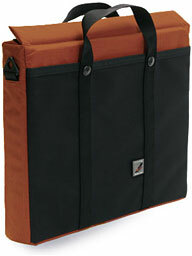 Available for pre-order from the Tom Bihn website; ships by late November. Made in Seattle. 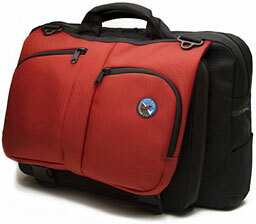 Tom Bihn customers have been using the Brain Cell laptop case to protect their Mac laptops everywhere from Iraq to Antarctica for over 10 years, giving the Brain Cell its word-of-mouth reputation as providing some of the best protection one can get for their laptop. Now the Brain Cell is available in a size specifically designed to carry the New 15.4" MacBook Pro: Size 4Z. MacBook users will want Size 6 for all versions of the 13" MacBook. Among the protective materials that make the Brain Cell are 8mm thick soft foam padding, 4mm hard corrugated plastic, crosslinked closed-cell polyethylene foam, and 12mm thick premium memory foam. The Brain Cell Size 4Z is $60. Available for pre-order from the Tom Bihn website; ships by late November. Available in two formats: Horizontal for use in messenger bags or briefcases and Vertical for use in backpacks. Made in Seattle. PR: With the new Belkin FlyThru laptop case, you no longer need to remove your laptop from the bag in the airport security line, making it a painless, stress-free experience. 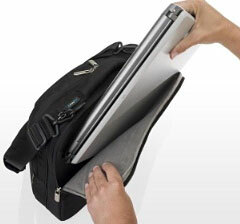 FlyThru isolates your laptop on one side, allowing TSA agents to easily identify it through a clear window. Accessories are kept organized and secure on the other side of the bag, sending you through security faster. Belkin developed this checkpoint-friendly bag, which meets the guidelines set forth by TSA, with the business traveler in mind. Just unzip the case and lay it flat on the screening belt. Thoughtful design elements like the zipper position lets you grab your bag right off the belt and head off to your gate, without anything falling out. Fits most standard and widescreen laptops up to 15.4"
Available through a network of major distributors, resellers, and superstores. PR: Other World Computing (OWC) has added two new free, step-by-step installation videos to its comprehensive library of step-by-step guides to assist owners of new Apple MacBook 13" and MacBook Pro 15" models with hard drive and memory upgrades for greater performance over factory configurations. The free online installation videos for both hard drive and OWC memory upgrades for the latest MacBook and MacBook Pro models are rated at an "Easy" level, and can be performed at home with an estimated 15-minute installation time. These new installation videos, as well as installation videos for existing MacBook and MacBook Pro models, are available via OWC's MacBook/MacBook Pro upgrade page. OWC offers new and existing model MacBook and MacBook Pro owners a full selection of cost-effective 2.5" SATA internal hard drive and OWC Memory Upgrade Kits to increase performance over the factory stock configuration. Prices start at $57.99 for a 200 GB 5400 RPM drive, with the most popular upgrades including a 320 GB 7200 RPM drive priced at $114.99 and a 500 GB 5400 RPM drive priced at $179.99. OWC hard drive upgrades often cost far less than similar options installed at the factory, as well as offering a longer warranty. In addition, MacBook and MacBook Pro owners that purchase a new drive from OWC also enjoy the benefit of keeping their existing drive, which can be used as a temporary backup drive, converted into an external storage solution, or sent to OWC for a cash back trade-in. "At OWC, we want to provide customers with all the tools they need to make the most out of the Macs they have - including high quality, value priced upgrade kits and toolkits; free step-by-step installation videos; free US-based technical support; rebate programs; and enclosures that give a second life to upgraded parts," said Larry O'Connor, President, OWC. "Our mission is to enhance the performance of the newest Macs, as well as breathe new life into legacy Macs to maximize their value." This module is specifically designed and SPD configured for the MacBook Aluminum. This is a sale item, no promotions or discounts apply.